Can I Run in the Winter? Running is great exercise, so of course many runners don’t want to give it up, despite our chilling winter weather. A common complaint I hear from runners is the burning sensation they feel in their lungs during or after running out in the cold. If you are an avid runner, and you are healthy, the winter burn is most likely due to the lack of moisture in both the cold winter air and in your lungs. In the winter, most people tend to drink less water and eat fewer leafy vegetables; instead, they gravitate towards more starchy comfort foods. Plus, heating makes indoor spaces very dry, and thus dehydrating. 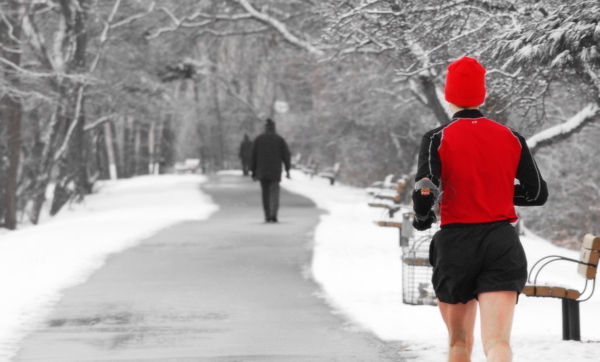 Winter running is safe – as long as you dress appropriately. On a very cold day, you will lose a lot of heat from your head (about 40 percent) so make sure to wear a toque and wear a scarf over your mouth and nose or a balaclava, so that the air is moistened before entering your lungs. Having said that, if there is an extreme windchill warning, I recommend that you head to the gym and have a good run on the treadmill instead. Hydration is crucial, so make sure that you drink plenty of water, even if you feel less thirsty than you do during warmer weather. Ideally your water should be luke warm or room temperature, not cold! Your internal temperature is about 37 degrees Celsius, and your body needs to bring the temperature of cold water down in order to use it effectively. Room temperature water is ready to be used by your tissues and organs right away. Of course, if you have persistent pain you should visit your doctor, or discontinue outdoor running until the warm weather hits again. It almost goes without saying, but injuries are common during the winter, so run on cleared paths and be extra cautious of icy spots. To be safer, you can also purchase traction spikes or grips that you can put right on your shoes to prevent slips. LOOK AMAZING, FEEL GREAT, & HAVE A BLAST WITH BEST BODY BOOTCAMP. Sign up now and enjoy Total Body Conditioning for Men and Women at one of our 10 indoor locations at bestbodybootcamp.com. Image courtesy of M.V. Jantzen.